At which point, picking platano pollen out of my teeth, I decided that Ladies of Leisure were more inclined towards Farscape marathons in a darkened room with the window firmly shut than quiet contemplation of nature's annual miracle. That particular miracle is a loaded one. Both barrels. This past Sunday, when the zephyrs were turned off for the afternoon and the fuzz was away on half-holiday, Mr Tabubil took me for a stroll around our local park. As we progressed toward the children's playground, we noticed that the children we passed all seemed to be lightly tinted pink. Leaving Mr Tabubil in the dust, I made a beeline for the playground. The Fairy Floss man was here! 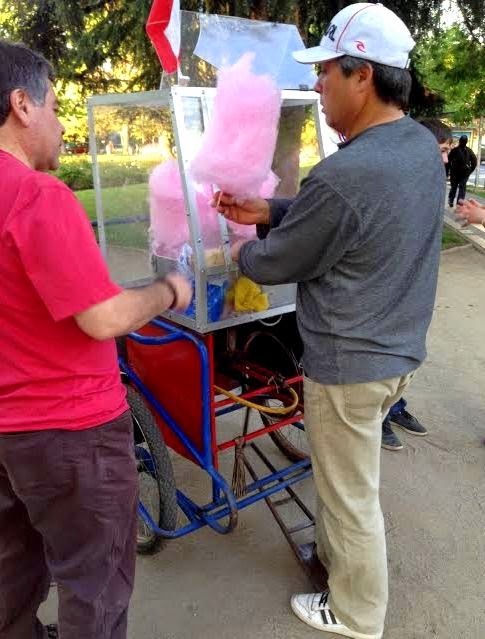 Our fairy-floss man pushes a hand-cart with a treadle-powered fairy-floss machine. Pumping the treadle with his foot, he dips a wooden stick into the spinning sugar vat, and neatly twirls you a cloud of pink sugar-floss larger than your head. Mr Tabubil treated me to a stick, and I ate it, and life was very good. We wandered back up the park, and I found a man with a hose who let me wash my hands and drink some water, and life was even better. Fairy-floss is divine, but sticky is sticky.